This movie is just plain dumb. There is nothing wrong with the acting or direction....this is a competently put together movie. The problem with it is the dumb script. It's one of those movies where you constantly find yourself asking "why the hell did they do that?" because so many of the characters' actions are illogical. The premise is fine - 4 criminals on the run from the cops after a heist stash the cash on the roof-rack of a family's car so they can beat the police road-blocks and hopefully pick the money up later....So you're watching the film, it seems a fairly interesting idea for an action movie, the baddies have just beaten the road-block and found the family car with their money, you're anticipating some plot twist and then you hear "lets run them off the road" ...dohhh! 99.9% of the world would simply follow the car until it stopped somewhere before taking the money back hassle free but our gang of criminal masterminds think it's a great idea to try and run the car off the the open road in broad daylight. Okay, that's lazy writing but the action had to kick off somehow and you want to give the movie a chance so you take your head from out of your hands and start watching again in hope that it will be the only stupid plot point.....wrong! The litany of stupidity continues right the way through the film....if I tried to list all the illogical behaviour of the characters in "Transit" then I would be here all day. I'd like to say that if you were prepared to put your brain in a jam-jar for 90 minutes then you may enjoy this film but I can't even do that. 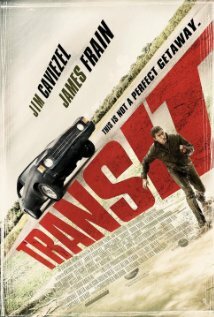 Irrispective of the characters' stupidity, "Transit" also turns out to be a highly unoriginal piece of work which we've all seen done much better many many times before.